This musical Irish Santa Claus is holding a wreath that is enhanced with shamrocks and the words Nollaig Shona Duit. This Irish Santa's greeting of Nollaig Shona Duit is Happy Christmas to You in IRISH! 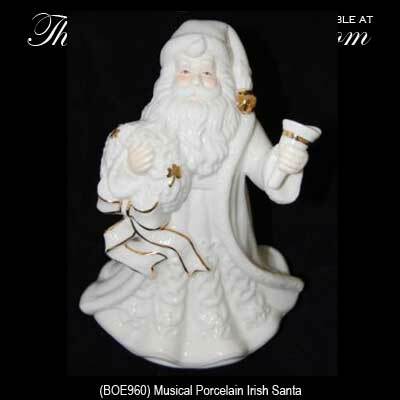 The Irish Santa is a musical figurine that when wound up plays the We Wish You a Merry Christmas melody. The musical Irish Santa features a sack of toys on his back along with shamrocks and a wreath that has the Gaelic words for Happy Christmas to You, Nollaig Shona Duit. The Irish Santa is made of white porcelain with gold accenting and he measures 8” tall x 6" wide. Santa's Robe has White on White Celtic Knots and Shamrocks Too!